Mix 150ml water with the baobab powder to form a smooth paste. Place the remaining water in a saucepan and dissolve the sugar slowly, then bring to the boil for 10 minutes. Remove saucepan from the heat and allow to cool completely. 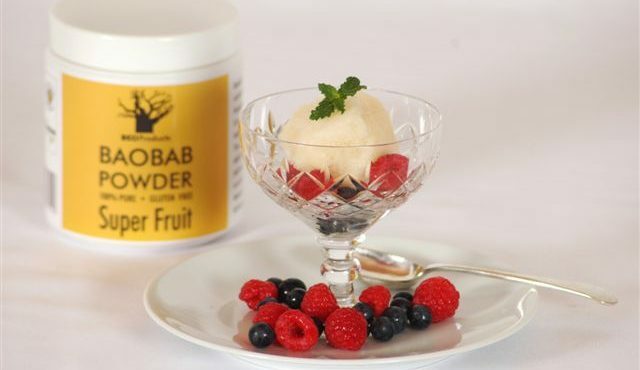 Add the syrup to the baobab powder paste a little at a time to avoid forming lumps. Pour into a suitable container for freezing and place in freezer until the mixture is thick and slushy. Beat egg white until stiff and fold into the semi-frozen mixture. Return to the freezer and freeze until stiff. Remove sorbet from freezer 10 minutes before serving.